If you can stomach being a contrarian, Caterpillar and Deere are two stocks you should have on your radar. It's a really bad time for companies that make heavy machinery. Caterpillar (NYSE:CAT) and Deere & Co. (NYSE:DE) are prime examples of the pain the industry is suffering through -- which is also why these are two big-brand stocks you may be overlooking. When the commodity downturn started in 2011 or so, miners began to retrench. That meant cutting back on growth, which, in turn, meant less need for new earth-moving equipment. There's also been a downturn in other commodities, notably the grains we eat and that get grown and harvested using John Deere tractors. Farms have cut back, meaning fewer new tractors are getting sold. Now, some companies have benefited from this downturn. Take, for example, Ritchie Bros. Auctioneers (NYSE:RBA), an auction giant that focuses on heavy equipment. The company has seen an influx of used equipment that has pushed its top line higher each year since the start of the decade. Earnings have been a little more volatile, but have trended generally higher, too. More secondhand machinery makes like harder for original equipment makers like Caterpillar and Deere. Caterpillar's top line peaked in 2012 and has been heading lower since. Earnings last year were less than half what they were in 2012. At Deere, revenue peaked in 2013 and has fallen since, with earnings off by a touch more than a third over the span. And there's more pain to come this year, with fiscal 2016 results down from 2015 numbers at both companies so far. Why would you want to catch either of these falling knives? First off, despite the deep industry pain that's sent many of this pair's customers into the red, neither Caterpillar nor Deere is losing money. It's pretty impressive when you can be in the depths of an industry downturn and still pull off black ink. Moreover, both continue to pay their dividends, even though dividend coverage is starting to get tight. Caterpillar has a 22-year history of annual dividend hikes, while Deere's streak is 12 years. Neither has increased their dividend recently, which is a worry, but despite the top- and bottom-line pain there have been no cuts, either. Caterpillar offers a 3.75% yield and Deere a nearly 3% yield. 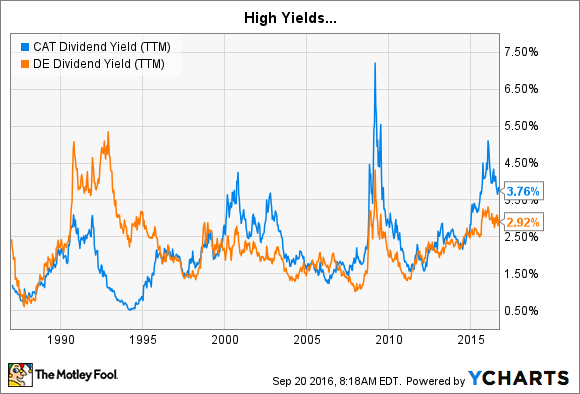 More importantly, both yields are toward the high end of their historic ranges. CAT Dividend Yield (TTM) data by YCharts. So they are troubled companies, but they aren't falling off a cliff. And they could be relative bargains, particularly if you are fond of dividends. The next big reason to look at Caterpillar and Deere is that, at the end of the day, they are giants with industry positions and global reach that would be virtually impossible to replicate today. Sure, they have competition, but if you think "farm equipment," you probably think about a green Deere tractor, and if you see a yellow backhoe, your first thought is likely that it's a Caterpillar. To put some numbers on this, Caterpillar has roughly 3,600 locations serving 182 countries. While all of those dealers aren't exclusive to Caterpillar, it would be hard to recreate that reach and the breadth of product that Caterpillar offers. The same holds true for Deere, which has over 2,400 dealer locations reaching into more than 100 countries. These companies have commanding positions in their industries and really are the big brands, a highly desirable trait from an investment standpoint. So, if you think we are still going to be growing food in five, 10, and 20 years, now could turn out to be a good time to buy Deere on the cheap. And if you believe construction and mining are industries that might recover over time, then Caterpillar looks like it could be on sale. This isn't to suggest that a turnaround is coming for either company tomorrow, only that they have proven their ability to survive bad times, continue to reward investors with dividends for sticking around, and that their businesses would be hard, if not impossible, to replace. It could get worse before it gets better. But if you have a long-term view and are willing to deal with a little of uncertainty in your investments, Caterpillar and Deere are two big-brand stocks you may be overlooking.